Blue Diamond's roots run deep in New York City. 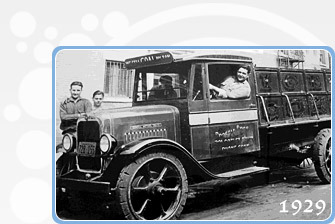 In fact, we've been providing home heating services since the early '20s. Like many other immigrants they came with little more than a dream and a desire to work hard. Domenico and Giacomo Proscia bid goodbye to their families in Bari, Italy and immigrated to the United States. The year was 1920, and they settled in Sunset Park, Brooklyn. Shortly thereafter they bought a truck and started a business supplying ice and coal in the neighborhood. Ice was used primarily for refrigeration, since the refrigerator had yet to make its debut as a ubiquitous appliance. It was sold to individuals as well as small businesses such as the neighborhood bars who used it for refrigeration, cooling drinks and even to the local street vendors who would use it to make flavored shaved ice, selling it in cups as treats during the hot Brooklyn summer. As the wood stove became obsolete as a means to heat the home, coal soon became the most efficient means of heating at the time. Coal was literally shoveled into a steam boiler which would in turn provide heat during the winter months. As the decade progressed the Proscia Brothers continued to provide all types of coal including the finest, labeled Blue Diamond. But it didn't stop there. As oil became more abundant and refining techniques improved, kerosene soon became an option for heating homes. This too became an energy product the Proscia brothers supplied, in 5-gallon cans, to their expanding client base. But it wasn't until the debut of the oil burner later in the decade that home heating took a major leap forward. The burners, comparative to previous technologies, were cleaner, more efficient and best of all, actually cheaper than coal. Throughout the 30's oil became the preferred method for home heating. Old steam boilers were converted to oil burning furnaces and tanks were installed. 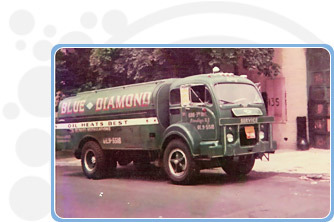 This marked the beginning of Blue Diamond Fuel Oil. In the late 40's and early 50's as the company grew, a new generation of family members became involved with the company. Domenico's two sons, Michael and Francis along with Richard and Saverio, sons of Giacomo, led the expansion of the company, offering newer and more modern heating equipment and the services necessary to provide their clients with worry free comfort. For the next 30 years the company grew and expanded its service areas outside the Sunset Park area. With the oil embargo in 1977, the heating market took a new direction and began shifting towards Natural Gas - a commodity plentiful in the US. The family realized that Blue Diamond had to adjust to changing times and move towards supplying their clients with the expertise necessary to install and service natural gas heating systems. And so, Blue Diamond expanded once again, driven by innovation, market forces, and the desire and responsibility to provide their clients the very best options available in the heating market. 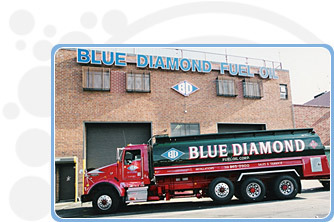 The dawn of the new millennium brought with it a new vision for Blue Diamond Fuel. With de-regulation came the opportunity to provide their clients with an alternative to the big utility companies. This led Blue Diamond to present natural gas as an option to their clients, at considerable savings over the public utility companies. 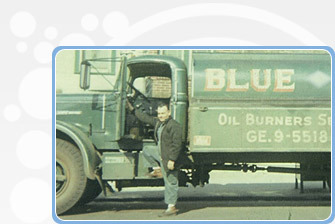 Throughout its history Blue Diamond has always been driven in response to the needs of their clients; heating oil and eventually to natural gas. In 2014, the company relocated to a new, state-of-the-art facility in Bayridge, Brooklyn, featuring enhanced networking infrastructure for improved dispatch and customer service operations. As we move along the 21st century other energy options including renewable energy sources will become available and Blue Diamond Fuel will remain at the forefront of the home comfort industry by continuing to be a client-driven, innovative company supplying the very best service and products available, and by never forgetting Domenico, Giacomo and the principles behind their success: quality, reliability, integrity - the Blue Diamond of the industry.